Hiking trails - Explore Bonaire! This hiking trail takes you to the top of the Bara di Karta Hill of 57 meters high. Here you get a wonderful view of a great part of Bonaire. It is a hike of about 15 minutes, including a short climb. An easy hike of about 45 minutes, in half shade and in a gentle slope. You hike through a special area with a view of large rock formations and the sea. This brisk walk with some gentle slopes, leads you through the rough nature of Rincon. The hike takes about an hour. Along the way you get a beautiful view of Goto Lake. This is a pretty challenging trail which takes you round the Red Hill towards the Lagun beach and back, in about an hour and a half. The sea on this Eastern side is pretty rough where you see the waves smashing on the rocks on windy days, providing a magnificent spectacle. Montaña means mountain. This hiking trail takes just about an hour and a half and rises constantly. You reach the top of the hill by climbing a little, after which you will be rewarded with a splendid view over the hills and the sea. There are beautiful old trees along this trail. 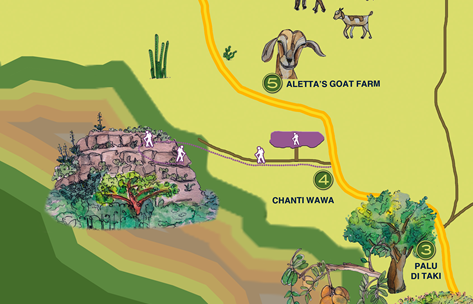 This hiking trail takes you to the top of the Chanti Wawa Hill. Here you get a wonderful view of Tras di Montaña and the East coast. It is a hike of about 30 minutes, including a short but steep climb. Admire the red palu di sia trees along this trail. 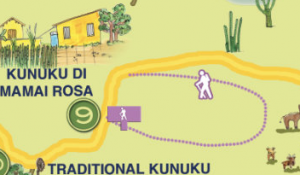 The Seru Largu trail is an easy walk of about 45 minutes. You will get a great view of Kralendijk, Tras di Montaña and the East coast. Along this trail there are many brazil trees, and none of them look the same. 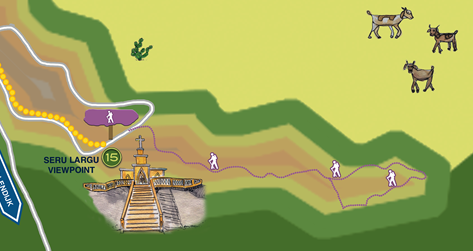 The Mamai Rosa walk takes 40 minutes. This is a walk through an old kunuku area, you will come across a ruin of a kunuku house.